The Catholic Bishop of Gboko Diocese, Most Rev. Williams Avenya, has lamented that the people of Benue state could only receive 73 corpses in return despite their massive support to the All Progressives Congress, APC party during the last election. Bishop Avenya who condemned the recent massacre of innocent indigenes of the state by herdsmen in his funeral oration at the mass burial service for the 73 slain indigenes of the state however prayed for the repose of the souls of the dead and called for prayers for the survivors of the attacks. Meanwhile, an elder statesman and Second Republic Minister of Steel and Industry, Mr. Paul Unongo, sounded a strong warning to the aggressors saying ” enough is enough”. Earlier, Governor Samuel Ortom of Benue state has again rejected the suggestion that the state create Cattle Colony or Grazing Routes for herdsmen. Ortom stated this on Thursday in Makurdi in a service to mark the mass burial of the victims of the herdsmen invasion. He had stated this position on Wednesday at a stakeholders’ meeting attended by the Inspector General of Police. Idris Ibrahim. On Thursday, he said since the state does not even have adequate land for farmers, it does not have the space to give herdsmen for grazing. He insisted on ranching, saying “it is the best way to go and it is in conformity with global best practices”. Ortom said if the recent killings by herdsmen were meant to intimidate the state government to repeal the law, the herdsmen had failed woefully. He also blamed the killings of Benue indigenes on the silence of the Federal Government and others responsible for the security of lives and property, an accusation he also made on Wednesday. Ortom lamented that if the Federal Government had acted on the reports he gave it concerning the threats of attacks by the leader of Miyetti Allah, Kautal Hore, the killings would have been averted. He urged the Federal Government to arrest the leadership of the Miyetti Allah Kautal Hore, because they had severally made incisive statements against the state. He, therefore, stated that the recent killings were a pointer to the fact that they had threatened and executed their devilish threats. He condoled with the families of the slain victims and those that were injured as well as those that lost their property. Also speaking, the Christian Association of Nigeria, CAN Chairman, Rev. Akpen Leva, urged Benue citizens to unite irrespective of tribe, political and religious differences in order to tackle their enemies. Leva described the attacks as a “genocide” that was targeted at exterminating the Tiv’s. Former Military Governor of Katsina State, Gen. Lawrence Onoja (rtd) also described the attacks as “a conspiracy against the indigenes” and said it would be resisted. Also in a funeral eulogy, Sen. Joseph Waku said the state has had enough of the senseless killings, adding that ”enough is enough”. The Tor Tiv, Prof James Ayatse alleged that the killings in the New Year attacks were signs of an ethnic cleansing agenda. He encouraged Governor Samuel Ortom to stand firm in his resolve to implement the anti-open grazing law, no matter the threats from the Miyetti Allah Kautal Hore. Also in a speech, the Country Representative of the UN in Nigeria, Mr. Martins Ejidike, said the world body would consider the request for humanitarian assistance to the 50,000 displaced people during the attacks. He assured that the UN would further discuss the details of the assistance with the Benue governor and prayed for peace in the state. One of the survivors, Mr. Akaater Azera, said the herdsmen came in the night while they were asleep and started shooting sporadically. According to him, when his wife came out, the gun toting men shot and killed her on the spot. Azera added that when he ran out of the house, he was pursued, with machete cuts inflicted on his face and leg. 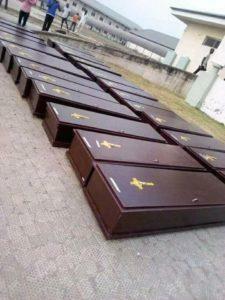 The post Benue received 73 corpses in return despite massive support to APC – Bishop Avenya appeared first on Vanguard News.